'Amazing Spider-Man: Renew Your Vows Vol. 2: The Venom Experiment' Review – AiPT! After an excellent first volume, Peter Parker’s super family adventures continue. I really enjoyed the first volume of Renew Your Vows, and with the second volume out, I was excited to jump right back in and see what happens next with the Parker household. The sensational adventures of the spectacular Spider-Family continue! And this time they’re joined by…the X-Men! Annie Parker just received an invitation to attend Xavier’s School for Gifted Youngsters -which means she’s going to get to meet Wolverine, Cyclops, Jean Grey and Professor X! But where the X-Men go, can Magneto be far behind? And after the Master of Magnetism and his Brotherhood of Evil Mutants make short work of the X-Men, it’s up to the Parkers to stop them! After finishing the second volume of Renew Your Vows, I was left feeling different about the series than when I started. I felt a touch disappointed and let down by what I read. It wasn’t bad, but it felt undercooked in areas and some elements weren’t fully explored. I assume that was because of the creative team switch, but that’s neither here nor there. The second volume of Renew Your Vows has a lot of stories going on within it, so let’s go over each of them. The first tale up is the Parker family heading to Xavier’s School for Gifted Youngsters where Annie is invited to join and train with other people who have powers. Peter thinks it is a good idea for Annie to enroll and be among people who have powers and could protect her, while Mary Jane thinks it’s bad to completely uproot their daughter. The Brotherhood of Evil shows up and shenanigans ensue. It’s a fun tale where the Parkers fight some classic/not-so classic X-Men villains, we see some unique differences in this alternate reality (like Jean and Logan having a kid), and lessons are learned. It’s probably the best story in the collection, but it’s held back a bit by Peter’s sudden interest in having Annie go to school so she could be around people like her. It feels like this worry comes out of nowhere and there’s only a singular throwaway line explaining what his reasoning is. The second mini-arc is the titular Venom Experiment. Mary Jane is starting to feel concerned about her role in the superhero family dynamic, worrying that she is draining too much power from Peter and that she won’t be able to fully protect Annie. Thus, when she hears a very convenient ad on TV about the company that Liz Allen runs that’s offering something that she may want, MJ checks it out and gets more than she bargained for. Unfortunately, the series take a poor turn here from my perspective. The plot is only two issues long and the story feels way too cramped, with so many plot points and character beats going on. The idea of MJ unintentionally using a symbiote to boost her powers (I mean, how does she not recognize what it is?) and struggling to control it sounds interesting, but it only lasts for two issues before everything is wrapped up pretty neatly. Combined with the fact that everything moves way too quickly or comes out of nowhere in this story, you are left feeling like there could have been a little more time spent to fully grow and develop things. Then we have a quick one-shot that focuses on Norman Osborn II, aka Normie, and a day in the life of him. It works well enough in exploring his character, his relationship with his deceased dad, and his views on the Spider family. It’s a good character-focused issue and it ultimately builds into the final arc of this book, The Curse of the Green Goblin. This is what everything has been building towards this entire run for the creative team, wrapping up the Normie storyline and setting the stage for the future. Like with the Venom material, I feel this could have gone on a bit longer to have some better development of the characters and story. Some of the material just didn’t have the weight it should have, like a certain character’s turn for instance, and a few more issues could have made for a stronger finale. As it is, it wraps up everything on a few good notes, but it feels like it rushed through a lot and ended things rather abruptly. It just didn’t feel as satisfying as it could have. That’s really the best way to describe the volume as a whole. It could have been better, even if it wasn’t exactly bad. The storylines aren’t bad at all and most of the story beats are pretty good, but they could have been better if more time was given to them. The characters aren’t bad — they’re decently developed and a lot of what they do makes enough sense and is believable. However, Annie was given the least amount of attention, focusing less on her life and day-to-day activities. It’s a shame really, since we are jumping forward and moving onto another stage of her life at the end when it feels like there’s still plenty of potential with her as a young kid (plus, there are very few kid superheroes and moving her up to a teenager already is disappointing). The rest of the writing wasn’t too bad overall, with good dialogue, humor, and moments throughout. I just wish it had better pacing and storytelling. The artwork is divided up among several different people. Ryan Stegman, the series’ original artist, draws the X-Men arc and the first half of the Venom storyline. 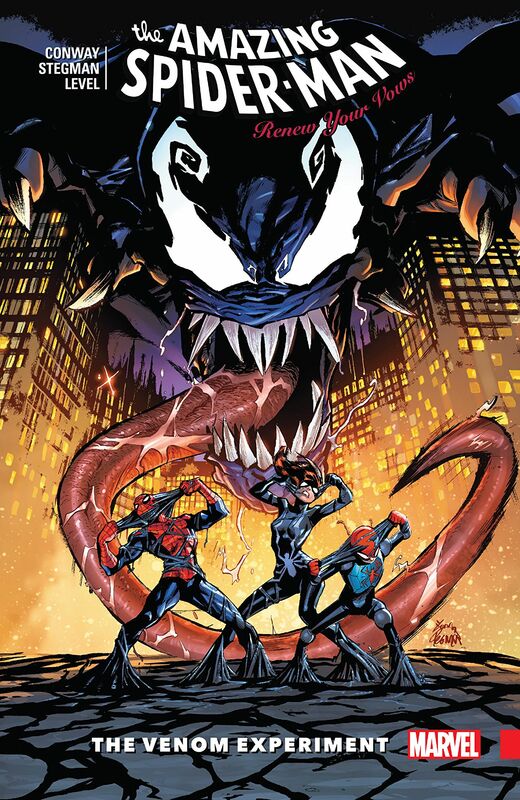 Juan Frigeri draws the second half of the Venom storyline. Then we have Nathan Stockman who draws a single issue and we end with Brian Level drawing the final arc. To the series’ credit, all the artists have a similar quality and style to their art in how they draw characters, depict emotion, create layouts, and draw the backgrounds. Happily, Jesus Aburtov does all of the coloring, helping the artistic consistency from issue to issue even with the multiple artists. Sure, you can definitely notice a change in style at times, but it’s not too drastic. Outside of some wonky facial expressions and awkward action in places, the artwork overall looked pretty good. The Amazing Spider-Man: Renew Your Vows Vol. 2: The Venom Experiment was a book with highs, but also quite a few lows in the form of disappointments. While all of the stories contained within are fun and feature enjoyable moments, good characters, and very nice artwork, they all suffer from a lack of proper pacing and setup. Things are just not fully developed or as explored as they should be, and with the series jumping several years into the future, there’s also tons of lost potential and ideas left behind. It’s by no means a bad comic, but it is one that I felt could have been better than it turned out to be. This was a book with highs, but also quite a few lows in the form of disappointments. While all of the stories contained within are fun and feature enjoyable moments, good characters, and very nice artwork, they all suffer from a lack of proper pacing and setup. Good storylines and interesting plot elements and ideas. The family dynamics are still a lot of the fun. Supporting characters and most of the writing are decent. The storylines move too quickly and aren’t explored fully. Most of the characters and plot threads are underdeveloped. There are too many abandoned threads, ideas, and concepts by the end of the comic.